Located in O Connell Street in Dublin’s City Centre. 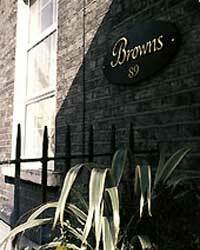 Browns hotel is the perfect location for the guest who wants to explore Dublin. The hotel is a combination of the old and the new. The roomy lounges and bright airy rooms are nicely decorated with paintings by the excellent artist Paddy Lennon. The 26 en suite bedrooms contain many facilities including TV, direct dial telephone and hair-dryers. The décor of the rooms was tastefully planned to fit in with the original Georgian building. Guests can relax with the complimentary tea and coffee which is served in the pleasant Gallery Lounge. Browns is the ideal location for that weekend shopping break. O'Connell Street and some of Dublin's main shopping districts are just a few minutes away. Trinity College, the Custom House and some other major tourist sights are on the hotel's doorstep. The bustling Temple Bar district is just a 15 minute stroll away.